Leland Henry Simonson was born April 5th, 1917, and passed away in Hillsboro, Oregon on March 12th, 2019, just shy of his 102nd birthday. Leland was born in Hockinson, Washington, the only child of Henry and Kate Simonson. His family farmed in his early life but later he and his father began logging. Lee’s family attended the Vancouver, Washington Foursquare church where he met and fell in love with a fiesty young beauty named Lorrayne Zoon. They soon married and began their life together. Their first two children, Larry and LeeAnn, were born in Vancouver, Washington. Lee and his dad, Henry, logged in eastern Oregon for quite a few years before moving to Smith River, California in 1950, when they learned timber property was available. Lee and Lorrayne’s youngest daughters, Loretta and Lavonne, were born in Crescent City. Lee and Lorrayne bought a sawmill and timberland in Smith River, continued to procure more timberland and bought the mill next to theirs creating a large operation which they eventually named Simonson Lumber Company. At its height, the company employed over 500 people between the mill and logging operations. The mill was honored with being one of the top 100 mills in the United States and was one of the first to use computerized saws. Lee was an excellent employer and was respected by his employees and he appreciated and respected them. Lee also loved the land and the trees and had a rigorous replanting program before it was required. His crew planted over a million trees. Lee and Lorrayne sold the mill and timberland in 1979. They made arrangements to make sure the mill stayed open for at least two years after the sale to give their employees time to make new career plans. They could see that times were changing for the industry. With the sale of the company, Lee and Lorrayne were able to make a sizeable donation LIFE Bible College, the Foursquare Church’s Ministerial training college in Los Angeles, CA. Their donation helped the college purchase a new campus in San Dimas, CA. which allowed for growth and development. Lee served on the Board of Regents for the college for several years helping to guide the college toward the future. Lee was not ready to retire so the family created a new family partnership, with his children called Simpco Lands. They invested in numerous projects including a partnership with Scott Lehman called Western Ag that included several ranches and the purchase and modernizing of the dairy which is now Alexandre Dairy. Simpco Lands created a large subdivision with a championship golf course, restaurant and Club House, in New Meadows, Idaho. Lee and Lorrayne loved this area of Idaho, and loved to golf. They eventually moved there in 2001 to enjoy family, the beauty of the Idaho heartland and of course…golf!! The hunting was pretty good too. They appreciated and enjoyed the community of New Meadows and its friendly people. When Lorrayne passed away in 2014, Lee moved up to Riggins, Idaho to live with his son Larry and his wife Nancy. He came to love and be loved by the close knit community and especially the Community Church. They helped him celebrate his 100th birthday in 2017. Lee then went to stay with his daughter Loretta and her husband Mark Coleman in Hillsboro, Oregon, until he passed away in their home. He enjoyed reading and watching the squirrels play in the yard. He loved the daily visits from his great grandkids that brightened his world. Lee had many passions. First and foremost was his commitment to his Faith in Jesus Christ. Second was his love and devotion to Lorrayne and then his family. 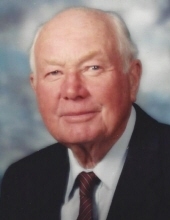 He was a huge supporter of his local church and world missions and made many trips to visit missionaries in foreign lands to support their efforts and learn about their work. He and Lorrayne and the family were blessed to be able to travel all over the world and in the states as well. He loved his community and tried to lend a hand and make his resources available to help when the need arose. Lee was an avid hunter and fisherman. He was a lifelong learner and avid reader, educating himself in many areas. He loved the outdoors and the family enjoyed hunting, fishing, camping, swimming, water skiing, snowmobiling, golfing, trail riding with horses and baseball in the back yard. He created wonderful memories for his children and grandchildren and for quite a few other people’s kids as well. Lee had a keen sense of humor and a dry wit that lasted ‘til the end. He was innovative, a hard worker and sharp business man, but he was also kind, generous and humble. He will be greatly missed. Lee was proceeded in death by his parents and his wife Lorrayne. He is survived by his four children, Larry and Nancy Simonson, LeeAnn and Roger Mattison, Loretta and Mark Coleman and Lavonne and Dave Powell, 13 grandchildren, 27 greatgrandchildren and one great great grandson, as well as nephews and nieces. A Private burial will take place beforehand at the Smith River Cemetery. Contributions in Lee’s memory can be made to the Crescent City Foursquare Church for their Mission Teams. To plant a tree in memory of Leland Henry Simonson, please visit our Tribute Store. "Email Address" would like to share the life celebration of Leland Henry Simonson. Click on the "link" to go to share a favorite memory or leave a condolence message for the family.